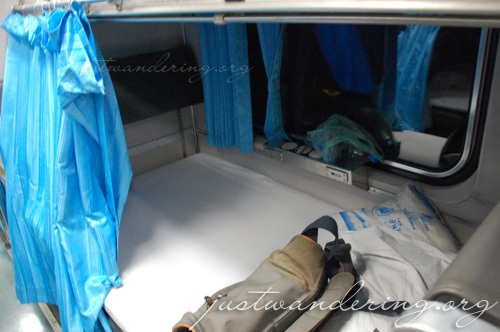 I am writing this from within my sleeping berth inside train 35 — the international express train from Bangkok to Butterworth. We pulled out of Bangkok just a couple of minutes past 2:45pm, its scheduled departure time. Estimated time of arrival is 12:55pm, Malaysian time. It has been a long day for me, and I am so glad to have finally given the sleeping car a try. I woke up early, at 7am to do my laundry. Laundry takes about 50 minutes on the hostel’s machine, and that gives me enough time to try to get back to sleep and to have a shower. I laundered all my clothes, save for the ones I am currently wearing. This would ensure that I have clean clothes when I get to Penang tomorrow. It was overcast this morning, and I was scared that I’d be packing wet clothes into my backpack, but luckily, the sun came out of the clouds and I have freshly laundered sun-dried clothes. I initially planned on checking out of the hostel early, leaving my backpack, going to MBK for brunch and some last minute shopping and heading back to pick up my things and taking a taxi to Hualumpong. However, when I looked at the map, I realized that MBK close to the station, so I figured I’ll just take the BTS to MBK to use up my remaining credits and to take the taxi to the train station. I also remembered the signs announcing that MBK now has a luggage counter, something that they didn’t have three years ago. So off I went, walking under the hot sun, weighed down with my heavy backpack, my messenger bag and my Envirosax bag. It was torturous, that walk to the BTS. And though there was an escalator from the street level to the BTS’s entrance, there were only stairs going up to the platform. At National Stadium, I got off the train and made my way to the 5th level of the MBK shopping centre. The fifth level is where the new Food Avenue is located. Within this food hall is the Tourist meeting area, Internet stations and luggage counter. To get there, you’d have to pass through the numerous counters serving different cuisines from around the world. This is an upmarket food court. 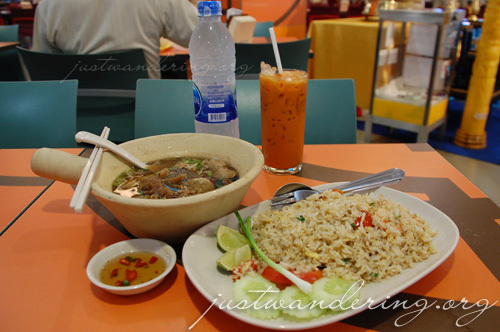 While 135 baht can already buy you two dishes and two drinks from the food court at the 6th floor, the same amount can only buy you one dish or dessert in the Food Avenue. 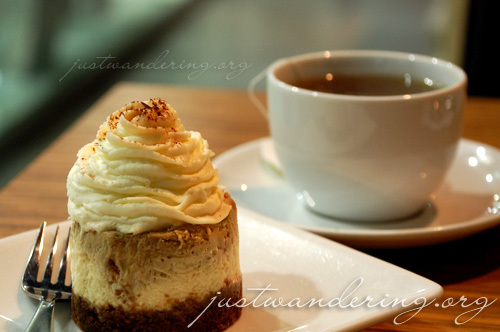 Still, it was a pretty slick idea, and the Tiramisu cheesecake I had there was pretty good. The Internet stations works the same as the one in Centre Point Plaza in Khao San road. It’s coin operated, and costs one baht per minute (minimum of 10 baht per use). The left luggage service is free for the first four hours, beyond four hours, you’d need to pay a fee. I didn’t have to pay for a single cent at for the luggage, since I only stayed for 2 hours at MBK. I left MBK right when the office workers who’ve gone out to lunch are already settled back in their desks. 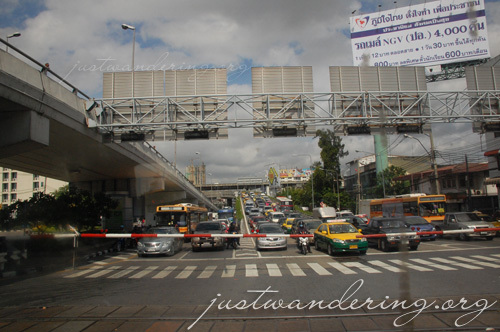 There’s light traffic, by Bangkok standards, and the drive to the train station was faster than the time it took me to find the taxi stand. The train was already waiting on Platform 5, and I made my way to car number 2, all the way down the platform. I was quite excited to board the train, even more so when I saw the fat pillows that came with each seat. However, the excitement was short lived, because as soon as it wound down, I realized I’ve nothing to do until lunch time tomorrow. It briefly came back though, as the train pulled out of the station, and after taking photos of random things, I settled to staring out the window. A uniformed man went down the aisle and offered a menu to the Caucasian guy across the aisle. He bypassed me, probably thinking I was local and not interested in overpriced food. That posed a problem though, since apparently, they do not serve food. As we were pulling into one station, I noticed a number of vendors carrying several styrofoam of prepared meals. I ignored them, while the Thais around me bought one each. That was dinner apparently. Darn it. Good thing I still have that packet of Ritz Bits I’ve been carting around since Cambodia, and the packet of Oreos I’ve had since Laos. Damnit, I’m eating breakfast tomorrow. Or find that damned dining car. Darkness soon fell, and as people finished their dinners, the train attendant went down the car, setting up the beds for the night. It’s a marvel, watching him transform two seats facing each other to the bed I’m now lying in, and pulling down the upper berth from the wall. Linens are provided, as well as a thick blanket. The pillows were given its own cases as well, earlier before the train even pulled out of the station. It was still freshly pressed and it felt so comforting to feel that smooth linen on my cheeks. It was still warm to boot. When my bed was all set, I gingerly sat down, took off my shoes and slowly laid down on my make-shift bed. That felt goooooood. I just hope I get any sleep tonight. OMG The E&O! Pangarap ko rin yan! I got lucky, my friend just told me that the Bangkok to Butterworth train just got cancelled indefinitely due to strikes in the Thailand side. Buti nalang I was able to get out in time!